The car matches the color of the driving player inside. 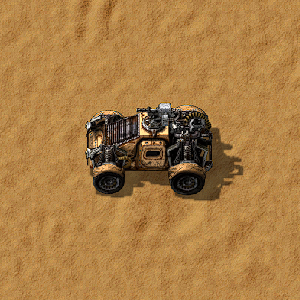 The car is the earliest alternate form of transportation available to the player, and is one of two non-rail vehicles in Factorio; the other being the tank. Although it requires fuel, driving a car is much faster than running, letting the player scout out areas or outmaneuver enemies. Cars have a vehicle machine gun that has a 50% higher rate of fire and can fire two tiles farther than the submachine gun, 80 slots of storage and 450 health, allowing the player to use hit-and-run tactics against small groups of enemies. Cars can collide with objects. Both the car and the object collided with may take damage. The damage is dependent on the speed of the car and the health of the target; small biters and trees can be safely rammed but colliding with big biters can easily destroy the vehicle and its contents. If the car is destroyed, the player gets ejected and not killed. 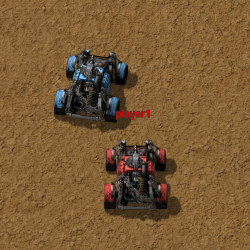 In multiplayer, it is possible for a player to enter a car alongside another player. The passenger can take control of the weapons of the car using a switch in the GUI of the car, but cannot steer the car. Cars are moved by transport belts and inserters can interact with them. Because of that, cars may be used as large chests or as another mean of transportation besides belts, trains and robots. Accelerating opposite of the velocity of the car will cause it to brake. Held acceleration controls won't have any effect after a brake. The faster the car is going, the longer distance it will take to brake. The more powerful the fuel used to power the car, the faster the car's acceleration: Solid fuel adds 20% acceleration, rocket fuel adds 80% while nuclear fuel adds 150%. Stone brick will reduce rolling resistance on cars, with concrete and refined concrete equally reducing resistance even further. Added support for equipment grids in cars. Running into biters in peaceful mode will anger them. Added filters to the car cargo inventory. Car ammo inventory is refilled from the trunk when depleted. Gates now open in time for the car to pass through. The car can now accept fuel and ammo by inserter or shift/control click even when the burner/ammo slots are already full. The extra fuel and ammo will go into the trunk. Decreased the car health from 2000 to 500. Health bar of car is now shown. This page was last edited on 23 December 2018, at 18:20.